MDC Alliance presidential candidate Nelson Chamisa is revelling in the seeming endorsement he got from Zimbabwe’s biggest dancehall star Winky D.
Winky D, who has brought Jamaican vibes to the country, has just dropped a hot rack dubbed Parliament that is being widely seen as an endorsement for Chamisa. The multiple award-winning Zimdancehall artist’es newly penned, campaign-specific hit song challenges the status quo and draws authorities to the appalling state of unemployed youths. He exhorts youths to vote for change. “Zvakanzi iye zvino mu Parliament hamuchadiwe vese vese makudiwa ma Gafa chete chete. 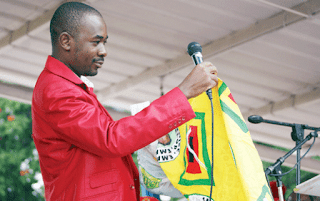 So kana usiri Gafa hauko ku Parliament (It was said that if you are not a Gafa then you cannot be a member of Parliament because those who are not Gafas are not wanted there anymore)” Chamisa said in apparent reference to the new hit song. In the song — produced by T-man of Mt Zion Records — Winky D, who is affectionately refereed to as the Gafa by his legion of fans, seems to be referring to the country’s need for a new beginning under a new political dispensation. “PaGhetto tateketera panematsutso, mazhinji vanenge Marechera Dambudzo,” Winky D sings, emblematically pointing to the suffering of ordinary young persons in the country’s impoverished high density suburbs and rural areas. The late Marechera was an extraordinary Zimbabwean novelist, short story writer, playwright and poet whose life and art was greatly informed by the poverty and turmoil of his home country. The 25 hit-maker appears to be referring to the Zanu PF ruling elite when he accuses them of being the authors of the country’s current economic problems which he calls Dambudzo in apparent reference to President Emmerson Mnangagwa’s second name. “Vamwe vati ita chiIndependent candidate, pama votes unowana percentage 100, hapachadi zvema pato pakuda solo zhet,” he sang seemingly lambasting the crowded list of presidential candidates. The song, which has already garnered thousands of views on his Winkyonline YouTube channel and other online platforms, is generating fast interest, especially from Zimbabweans who sympathise with Chamisa’s MDC Alliance and its catch phrase “Chamisa chete chete” from which they draw conclusions that Winky D was referring to their dream when he says “Gafa chete chete” in the song. Winky D has over the years positioned himself as the mouthpiece for the less privileged that stay in the ghettos, but has consistently maintained undertones when it comes to politics. Mapfumo recently released a seemingly pro-Chamisa album Chauya Chauya in which he rallies Zimbabweans to make their choice in the forthcoming July 30 elections without fear. Music is increasingly playing a role in the pageantry of the ongoing election campaign. Mnangagwa’s campaign has appropriated musical material mainly from Jah Prayzah for its campaign programmes. It has also sought out popular artists such as Sandra Ndebele and to use their works at campaign events or, even better, to have the artists themselves perform their own music or variations of those works during the campaign.